It was a strong month for me both from a savings standpoint and net worth position. 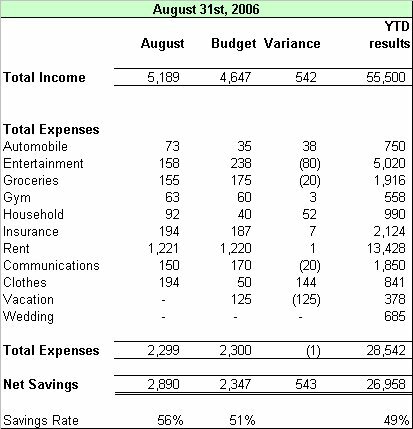 I had monthly savings of $2,890 on the month and a net worth increase of $3,484. I also reached my goal of saving $25,000 in one year in just 11 months. There is nothing large to report on the expense side of things. On the income side, I prepared a few tax returns for individuals adding $200 to my income. I'm also now averaging $150 per month in dividend and interest income. This continues to grow as my savings and net worth increase. As mentioned in my last savings update, I had sold some underperforming mutual funds and had yet to reinvest these funds. I bought a position in Proctor and Gamble. I'm still looking to invest another $7,500 but have yet to decide where to invest this. I must admit when I started this blog 11 months ago I really did not think I'd be able to save $25,000 in one year, but once I got started and changed a few bad habits it became easier and easier. - Limit dining out. I now on average eat out once a week. A year ago, I was probably going out 2-3 nights a week for dinner/drinks with friends. - Using PC financial reduced my bank fees and gives me a sizeable amount of interest each month. The more I save, the more money I make whether it's interest or dividends from investing in stocks. - Blogging my progress. After I started this blog I became much more conscious of my spending and saving because I felt accountable for my results. Each month when I was getting close to my maximum spending levels, I'd tighten my discretionary spending in an effort to meet my goals. Knowing that I was reporting to readers on a monthly basis gave me the discipline to not overspend. Congrats!! I hope to follow similar foot steps. Keep on blogging. On a side note, any reason for the purchase PG, or did you just want a reliable consumer goods stock? Question: How do you spend 155 dollars on groceries in one month? Do an article...I would be interested to see what is in your pantry. Kraft dinner? 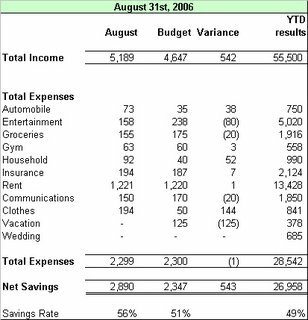 I'm also curious about how you manage to keep your food expenses so low...since you are not eating out as much this would mean that you are spending money on groceries in order to cook meals at home. I'm thinking you either don't eat much in quantity or you are getting by on crackers and water? First a disclaimer: I am not recommending PG to others. readers need to look at their own situation. 1) Portfolio management. You lacked a solid, long tem, consumer staples product. There is a time or everything. on track with Gillette. (Except, I am hoping they dump Scentstories if it keeps losing money). Apparently others like their products too, since their sales have grown from 56 to 68 mill.